I am always on the search for a dish I can replicate at home. Tortilla chips are one of my favorite snacks to buy pre-made at the store or to get out at a restaurant. 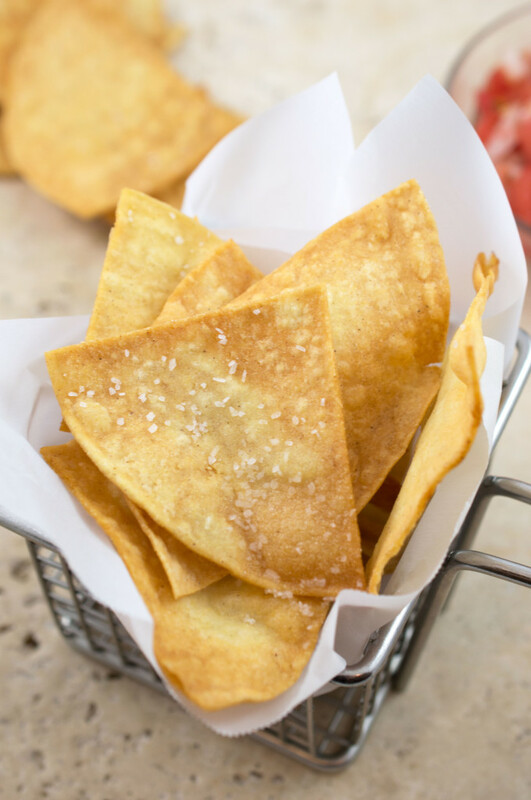 Once a novice tortilla maker, the thought of cooking tortilla chips at home always seemed to be too much work. The oil would spatter everywhere and I would be left with the annoying task of disposing the leftover grease. After making tortilla chips many times at home I have found it is not that bad after all. It is in fact EASY. Trust me, your effort is well worth the reward. 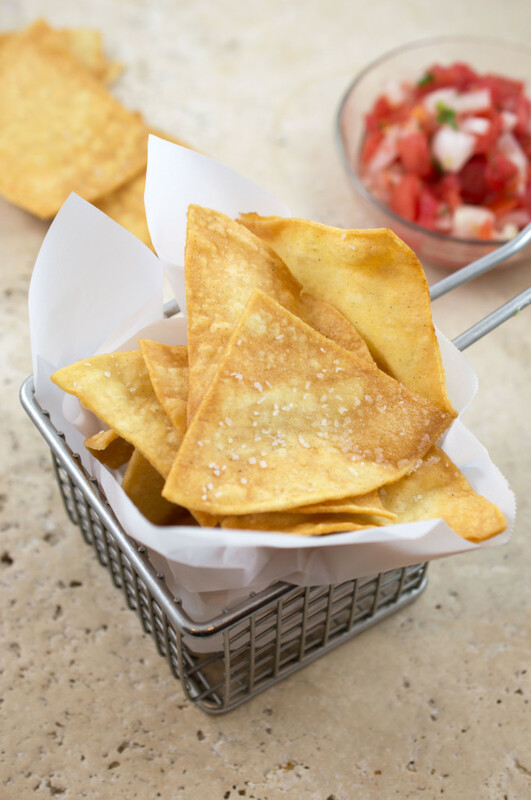 There is nothing better then these crunchy, salty, homemade tortilla chips! Let’s get started.. Begin by cutting the tortillas into half. Turn tortillas 90 degrees and cut again. You will be left with four equal pieces. 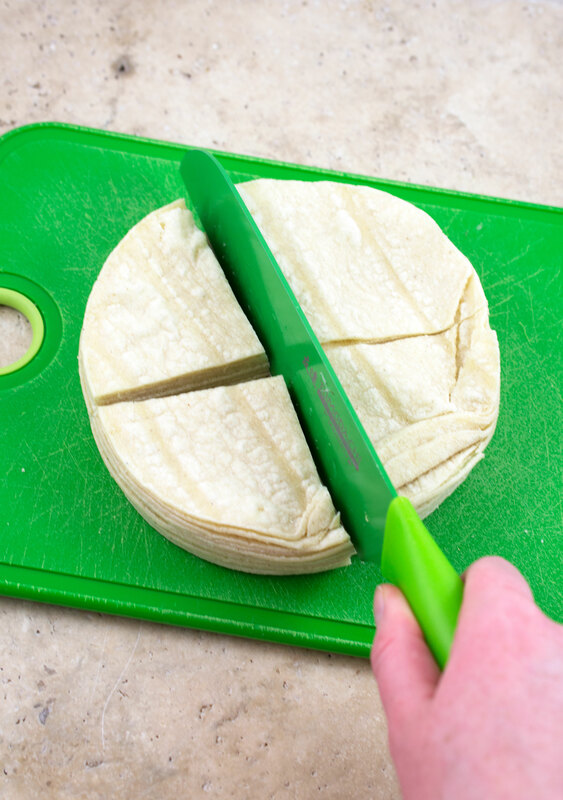 Separate tortillas to make sure they are not sticking to one another. In a large saucepan add in canola oil and heat over medium-high heat until it reaches a temperature of 350 degrees. Tip: Don’t have a thermometer? Add a pinch of flour to the oil and see if it sizzles. If it does your oil is ready. 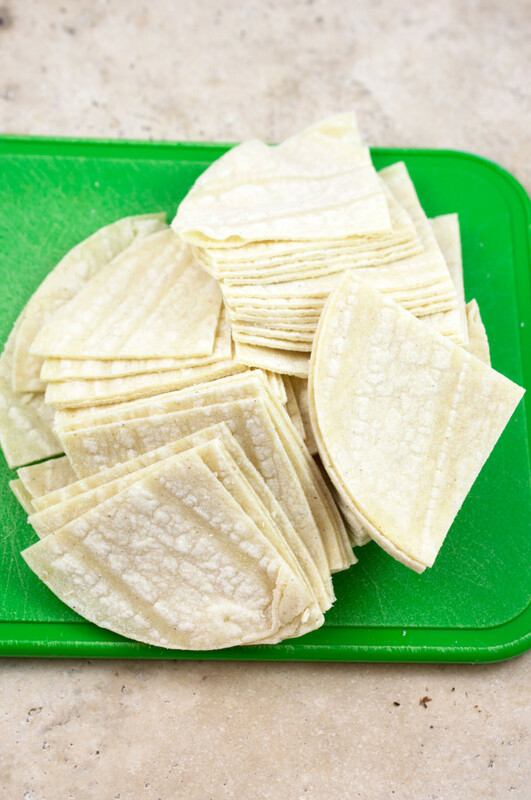 Add in tortilla chips leaving enough room for them to move around and not stick to one another. Let them cook about a minute on each side or until golden brown. 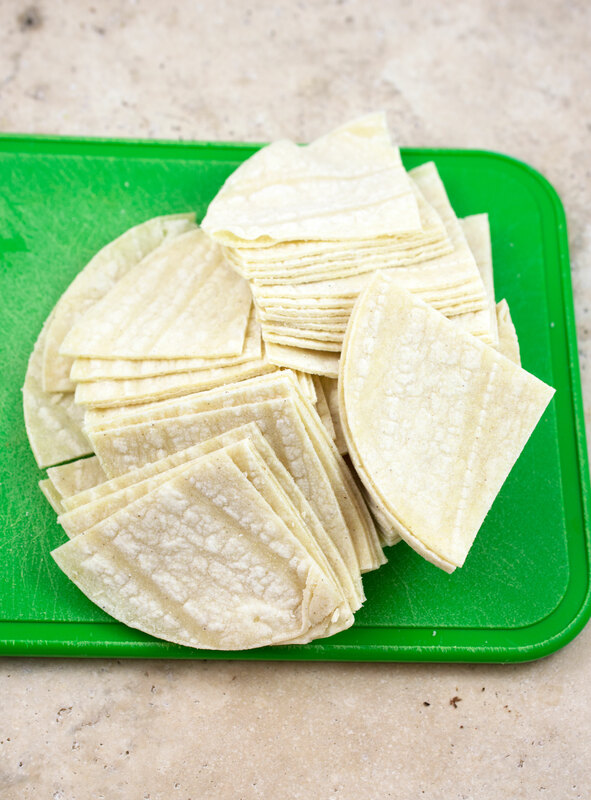 Lay your tortilla chips out on a plate lined with paper towels in one layer. Immediately after the chips come out of the oil sprinkle with salt. I use kosher salt because I like the larger salt crystals, but table salt will also do the trick. 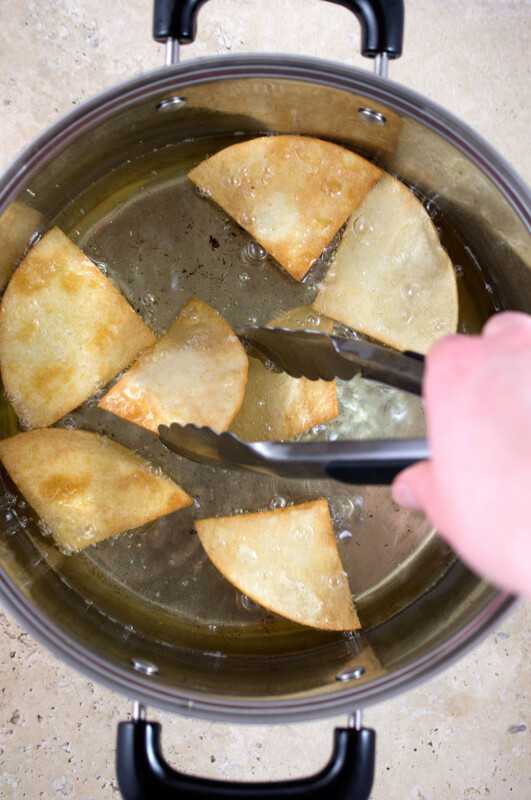 It is very important to salt the tortilla chips immediately after they are taken out of the oil. 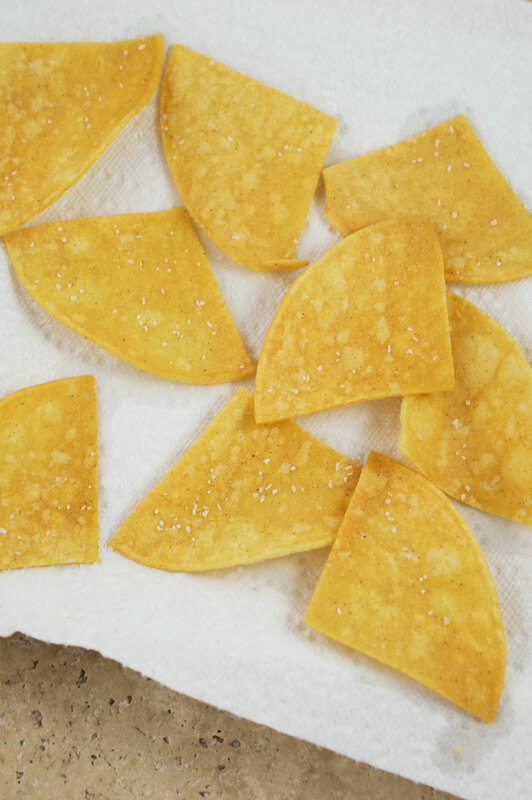 If you wait even a minute the tortilla chips will cool and the grease will drain off giving the salt nothing to adhere to. 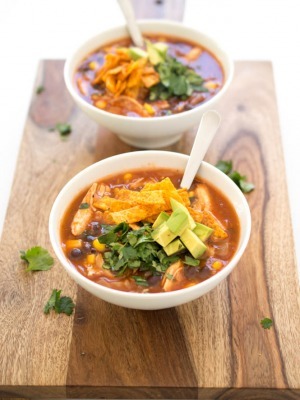 Serve with salsa, guacamole or my favorite queso with your homemade tortilla chips! Begin by heating canola oil in a large saucepan with high sides. Heat oil to 350 degrees. When oil is ready add in tortilla chips making sure not to crowd the pan (tortillas will stick together). 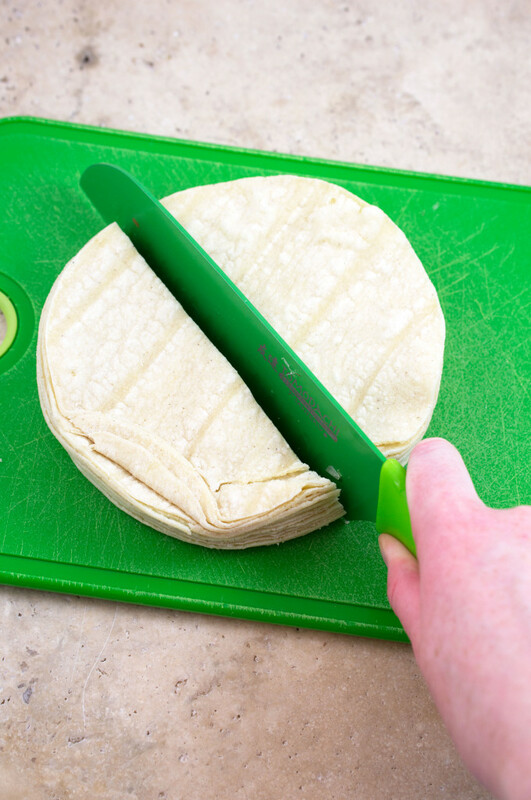 The tortillas take about 1 to 2 minutes on each side until golden brown. 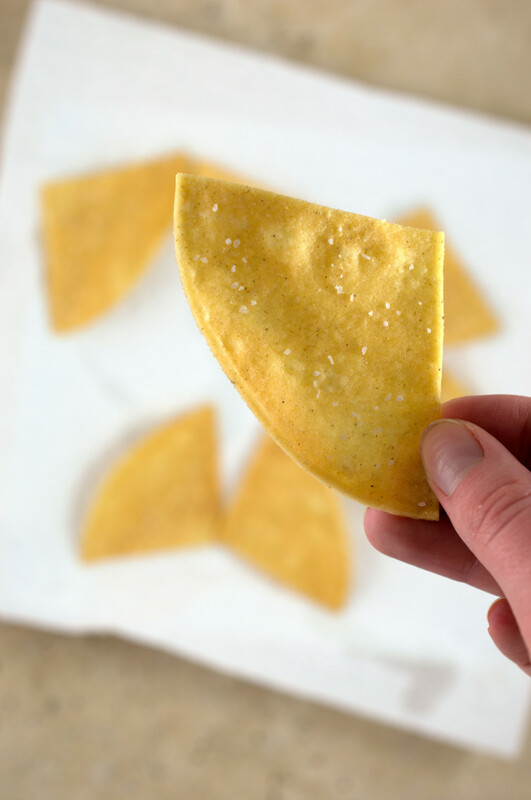 Take out tortilla chips and place on paper towels. Season with salt immediately. Allow to cool for one or two minutes and enjoy! These look way easier than I expected and I bet they are sooooo good! I am pretty picky about my tortilla chips, but when I find a good one I can sit there and dip them in salsa forever. 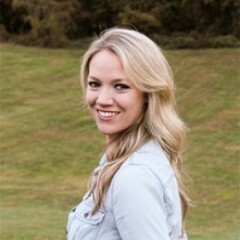 Thanks so much Jenna! I agree I love my chips and salsa combo. Yummy! Do you know how long they will keep? They never stay in my house for very long (we eat them up right away). I would say that they’ll keep 1-2 days before they go stale. Make sure to place them in a bowl at room temperature and cover. 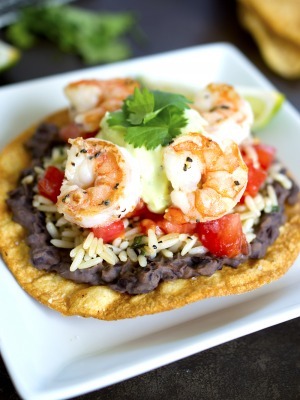 My family loves them!,, I also add some chopped cilantro when I add the salt for a variation. This recipe is requested often. So glad you liked them Debbie! Love the addition of cilantro! This is how we make them at the restaurant I work at, only using the large deep fat fryer. So easy and fast and taste much better than from a bag! does it really take 3 cups of canola oil because all of the other recipes i have seen don’t take that much. I used 3 cups you can always use less if you prefer. Can these be baked? (temp & how long? I would bake these ate 350 for 10-15 minutes. Something new and yummy to try.